I have been working hard this past week to get ahead of the Character Screens and GCS Importing and progress continues quickly! This week I spent some real time getting the Tracker to work on an individual character basis, general UI cleanup, and the behind the scenes work for the HP/FP bar at the top of the character's area. Odd "rollables" that you roll against often but aren't a skill or attribute. ...Anything you can think of! The bulk of the UI changes are on the character screens themselves, so you won't even know the difference there, but one important difference is the reorganization of the gCalc menu that comes with this release. Less emphasis will be put on the Tracker and more on the Character screen. In addition, more apps are now found within the Tools submenu, which is now reorganized to be more user friendly. Instead of just piling everything into the submenu in alphabetical order, I have reorder it to be a bit more usable. Special thanks goes out to all my patrons, especially my newest patron Jerry Crutchfield. Please find the full list of patrons below, and consider making your own donation to the cause at my Patreon. Thank you and happy GURPS Day! gCalc reaches it's $40/month goal and had 3,000 pageviews in February! Recently, thanks to some very generous Patrons, the gCalc project has hit its next goal of $40/month. What does this mean for you? Character Screens and GCS Importing!!! Recently I had a discussion with Richard Wilkes, the creator and developer of GCS, and we came to the conclusion that we are two halves of the same experience. His wonderful GCS program can create and manage characters, and gCalc can handle everything for you at the table....and so a partnership was formed. Richard will be adding a menu item to GCS which will allow you, the user, to export your character directly to gCalc! 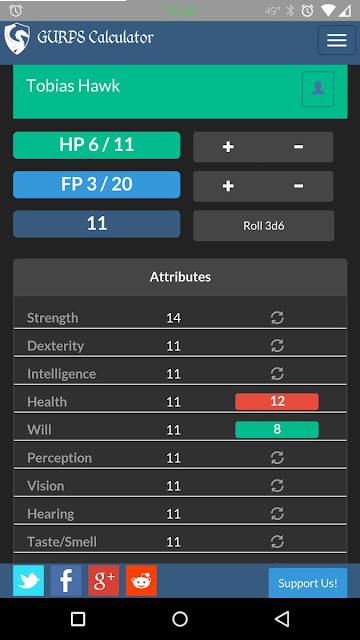 Once your character is uploaded you will be able to roll against stats, skills, and attacks. You will also have a full fledged Tracker suite for just your characters. This tracker will have all the functionality of the normal Tracker app, but will be tailored to just your character. And also, of course, you will be able to upload and manage multiple characters, allowing you to have many many characters across many campaigns. I'm looking to release this in the next month....and after that? Take a look at the next goal, I think you'll be pleased.